The Best of Houzz and Housewright Construction, Inc.
For people who are preparing to build or remodel a home or for those who simply love dreaming about it, Houzz is the Holy Grail of design inspiration. With the largest residential design database in the world – containing a multitude of gorgeous, professionally photographed homes, furnishings and landscapes – Houzz connects millions of homeowners, home design enthusiasts and home improvement professionals. 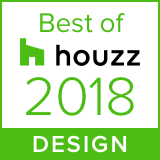 Housewright Construction is honored to announce that our Houzz portfolio account was awarded both the Best of Houzz 2018 Design and Customer Service badges. Each year the online Houzz user community selects these award recipients. The resulting winner list serves as a homeowner-to-homeowner guide to the top home builders, architects, interior designers, landscape pros and other residential remodeling professionals. View our Houzz portfolio here, then contact us to discuss how we can help you with your project. We would be delighted to set up a Houzz idea book with your name on it!